The Giant’s Shoulders #25: 2nd Anniversary Edition! What better way to introduce the second anniversary edition of the history of science blog carnival The Giant’s Shoulders than to share this photo of me, standing on the sholders of one such giant, Albert Einstein. As you may know, this summer I am a science education intern at the Oregon Museum of Science and Industry in Portland for their exhibit Einstein. 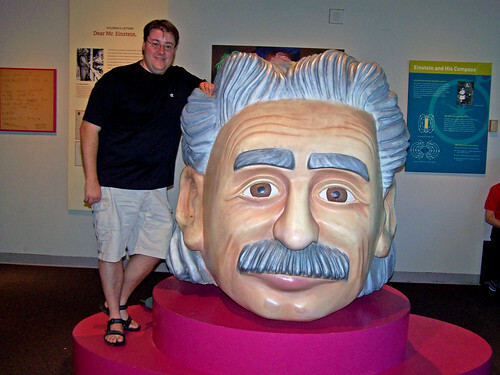 We allow kids to climb on this comical bust of Einstein up to his ears, but no farther. We must keep things safe! On November 30th 1660 a dozen men gathered to hear the young Christopher Wren give a lecture on astronomy. In the discussion that followed they decided to form a society for the study of the new and still controversial Experimental Philosophy. Two years later Charles II made it his Royal Society and in the 350 years since it was founded, its Fellows have given us gravity, evolution, the electron, the double helix, the internet and a large part of the modern world. In 2010 we celebrate 350 years of scientific brilliance and fearless doubt. 20th C., News and Views: The History of Science in America: Laserfest! 20th C., Uncertain Principles: Are Communication Skills Holding Science Back? 1625, Antoni van Leeuwenhoek Centraal: First Published Microscopy Article? Thanks for checking out this special edition of GS and hope you enjoyed some of the posts and, most of all, learned something new! Props to gg for maintaining this blog carnival for two years and hopefully more to come, since we can all use more history of science in our science blogging; and to Thony C. for submitting many of the posts for this edition. I previously hosted The Giant’s Shoulders in August 2009. Do consider submitting your history of science-themed blog post to the next edition of The Giant’s Shoulders to Scicurious at Are You Scicurious? Alternatively, you can use the carnival submission form. This entry was posted in giant's shoulders, history of science, Uncategorized by darwinsbulldog. Bookmark the permalink. Pingback: Get Ready for Awesome Giant’s Shoulders! « Are you Scicurious?